Apple released their iOS 11.3 software update last week and now we have some videos of iOS 11.3 vs iOS 11.2.6. The iOS 11.3 software update is Apple’s largest update since the release of iOS 11, it brings a range of new features to the iPhone and iPad. In the videos below we get to see the two versions of iOS side by side, first up is the iPhone 5S. As we can see from the video of the iPhone 5S, the handset running iOS 11.2.6 booted up a split second faster than the device running iOS 11.3, the two were so closed we almost missed it in the video. The two handsets were similar in the apps with some apps slightly faster in iOS 11.2.6. Next up is the iPhone 6. With the iPhone 6 the handset running iOS 11.2.6 booted up faster than the handset running iOS 11.3. The two handsets seemed about the same in the apps, next we have the iPhone 6S. The iPhone 6S running iOS 11.3 booted up faster than the handset running the older iOS 11.2.6 software. There does not appear to be any speed difference between the two handsets in the apps. Next we have the iPhone 7. 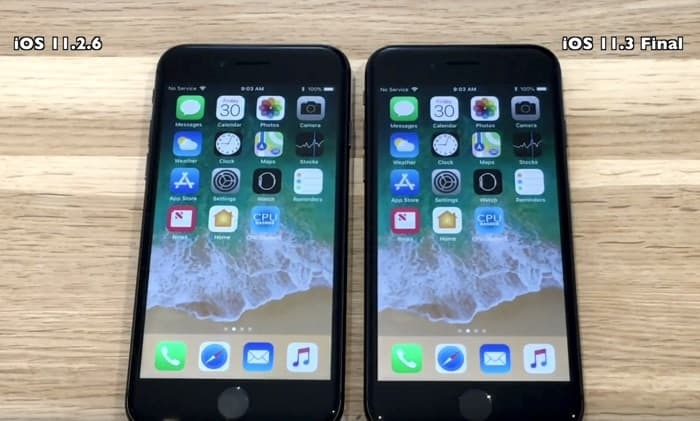 As we can see from the video of the iPhone 7, the device running the older iOS 11.2.6 software booted up slightly faster, there were no major differences in the apps. Finally we have the iPhone 8. In the last video the iPhone 8 running the new iOS 11.3 software booted up slightly faster. There does not appear to be any major speed improvements in the apps. It looks like the latest version of Apple’s iOS has brought no major speed enchancements to any of Apple’s iPhones.